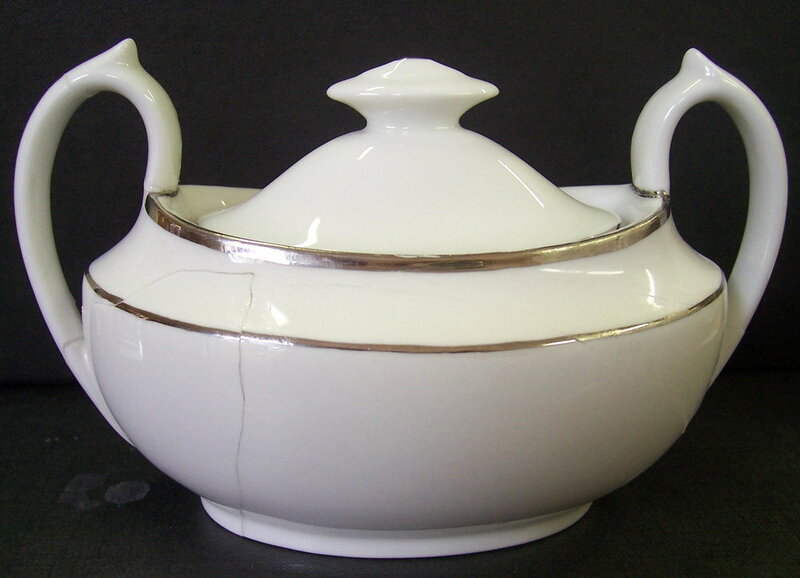 A1250 – Surrey shape white with solid gold handles. Entered 28/09/1960. 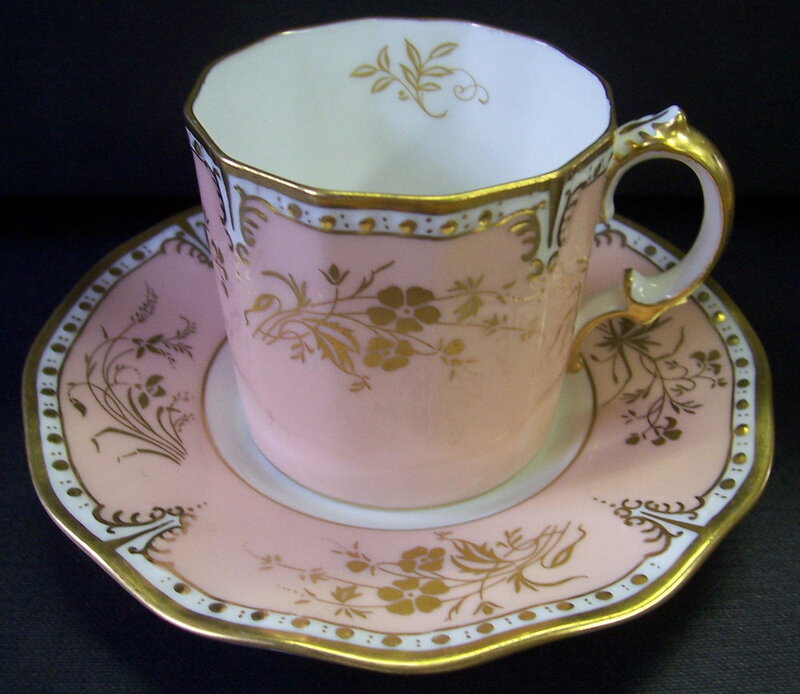 A1251 – Silver shape teacup and saucer with pink ground and Ellis litho sprays. Johnson and Matthey “Diana” litho sprays over ground. So far I have only seen examples in this pattern marked A1160 Diana. Entered 21/06/1961. 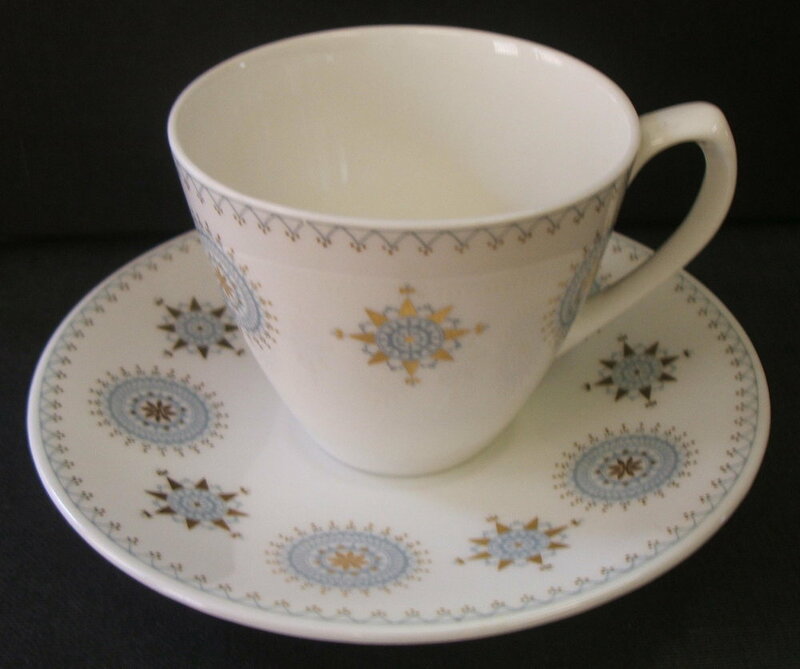 A1252 – Coffee Cups and Saucers in the Royal shape. 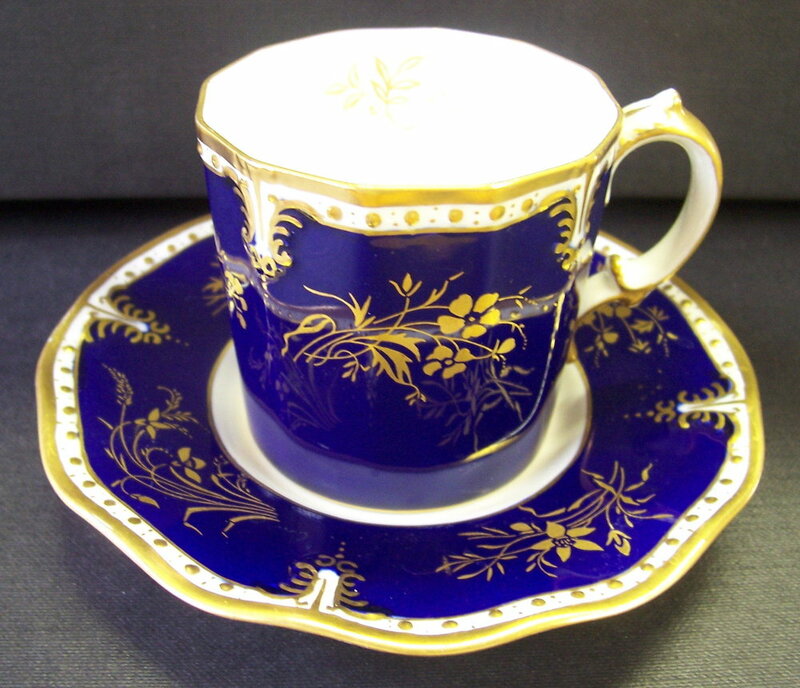 Four coloured grounds, Maroon, Cobalt, Salmon and Celadon on the cup extending from the embossment to the foot. Ground to saucer to rim only. St James gold sprays. No gold inner unlike A1221. Entered 09/03/1961. A1253 – “Derby Border”. A Johnson and Matthey Litho. Thick gold edge and traced handle. Listed under the Dublin shape it is also shown here in the first image in the Duesbury shape. A1254 “Madison” The first appearance of the Astra shape, an attempt to meet the changing tastes of the 1960’s. Another Johnson and Matthey Litho. Gold edge and traced handle. A1255 “Grosvenor” – Dublin shape. The cup and saucer in the image are the "Tall" version of this shape. Another Johnson and Matthey litho pattern with gold edge, foot line and traced handle. A1256 – “Red Festival” This version is in the Astra shape. The pattern is printed in red with no gilding. A1257 – “Blue Festival. Astra shape with blue printed pattern and no gilding. A1258 -“Midnight” Cobalt blue ground with gold printed pattern. Gold edge with solid gold knobs. A1259 “Antigua” – This version is in the Astra shape. Montreal green ground with gold print and edge. A1260 - This set meets all the criteria of this pattern in the pattern book having the Astra shape, cobalt ground and impressed mark to the saucer for 1962 apart from the fact that the pattern is listed as "Wilmot" which is clearly not the case. A plate in the same pattern with an "Exeter" centre appears on the Miscellaneous page. A1261 – “Diablo Red” – Astra shape with Johnson and Matthey litho pattern. No gold edge. A1262 – “Diablo Blue” – Blue version of A1261. A1263 “Simplicity” – Gold printed pattern in the Dublin shape. Traced handle. A1264 “Radiance” – Litho pattern on the Astra shape. Gold edge and traced handles. A1265 – “Fifth Avenue” – Dublin shape. Pale blue ground band with gold print on edge and double line below band. A1266 “Lucienne” - Astra Shape. Johnson and Matthey litho. Gold edge. A1267 “September” – Astra Shape. Capper Rataud’s litho pattern. Grey green ground to outside of hollow ware. Silver edges. Traced handle. A1271 - “Sprite”. Astra shape. Johnson and Matthey litho pattern. No gold edge. I have included an image of the coffee pot to demonstrate the shape. A1272 - “La Ronde” Dublin shape. Johnson and Matthey litho pattern with gold edge and line. The tea cup and saucer shown is the “Low” version of this shape. A1273 – “St George”. Dublin shape. Wide gold border, possibly acid etched, with gold line to shoulder, line to cup and traced handle. A1274 “Black Silhouette”. Dublin shape. As A1263 but printed in black, not gold. A1275 – “Silver Classic”. Sugar Box in the Dublin shape. White with thick silver edge and dash on handle. A1276 – “Black Silhouette”. As A1274 but without the centre. A1277 – “Mandarin”. Dublin shape. Johnson and Matthey litho pattern with gold edge. A1278 – “Lucienne”. Dublin shape. Another Johnson and Matthey litho pattern. Gold edge. A1279 “Antigua” Dublin shape. Here shown as a sugar box. As A1259 but in the Dublin and not Astra shape. A1280 “Blue Festival” – Dublin shape. As A1257 but in the Dublin and not Astra shape. A1285 “Prince Consort” – Queens Gadroon shape. Originally it would appear the pattern was called “Annabel”. Very difficult to tell apart from A340 Milford. White with a gold gadroon edge. Entered into the pattern book in November 1971. A1286 “Brocade”- Designed by June Branscombe - Queens Gadroon shape. Gold litho pattern again dated November 1971. A1287 “Caliph” – (June Branscombe) - Queens Gadroon shape. Another litho pattern with gold line at shoulder. A1288 “Pompeii” – Queens Gadroon shape. Yellow ground with apparently a black printed pattern (or perhaps a litho) over. Dentil around centre. First entered February 1980. A1289 – “Imperia” - (June Branscombe). Queens Gadroon shape. Litho pattern with hand enamelling in turquoise. Gilt foot line and traced handle. First entered February 1980. A1290 “Blue Paradise”. Here shown in both the Queens Gadroon and Heraldic shapes. By this time a litho was in use in place of the printing method. Hand gilt. Entered 9th June 1982. A1291 - “Aquitaine”. Queens Gadroon shape. Litho pattern. The light blue was probably added by hand. Hand gilt with dentil around centre. Entered 4th June 1980. A1292 – “Majesty” I have this listed under the Duesbury shape but a “Royal” shape plate appears above. Litho pattern and hand gilt. It appears to have been inspired by pattern 3615. Entered 8th June 1982. A1293 – “Derby Days”. Litho pattern on the Royal shape. A1308 is the same pattern on the surrey shape. A1294 – The first of a series of six patterns. These mostly appear on teacups and saucers or on sets of hexagonal covered boxes which are graduated in size. A1294 is believed to be in the Elizabeth shape. A litho pattern (to include the band inside the cup), apparently hand enamelled in red and hand gilt. Gold edge and foot line. Solid gold handle. Entered 2nd May 1984. A1295 is in the Ely/Chelsea shape. A litho pattern hand enamelled in red. Hand gilt gold edge, line at shoulder, foot line and traced handle. 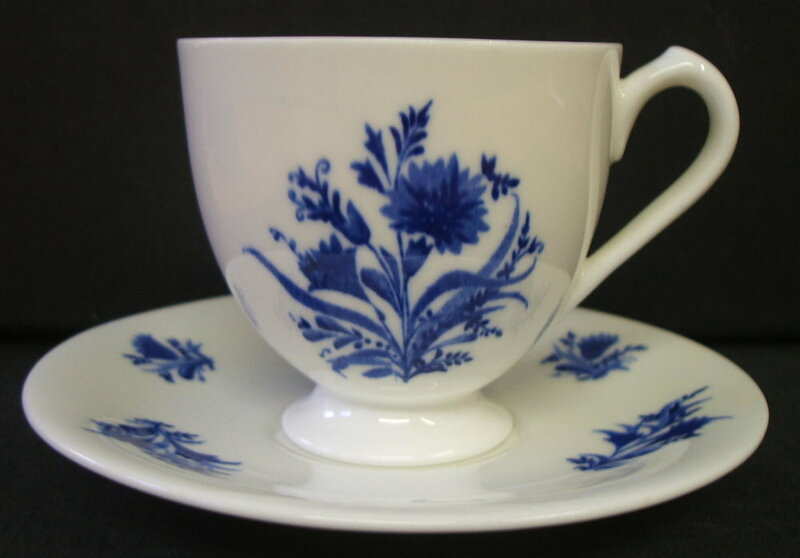 A1296 – Ely/Chelsea shape teacup and saucer. Litho pattern of humming birds, bell shaped flowers and leaves. Litho feather band inside cup. Hand gilt thick gold edge, line at shoulder, foot line and traced handle. 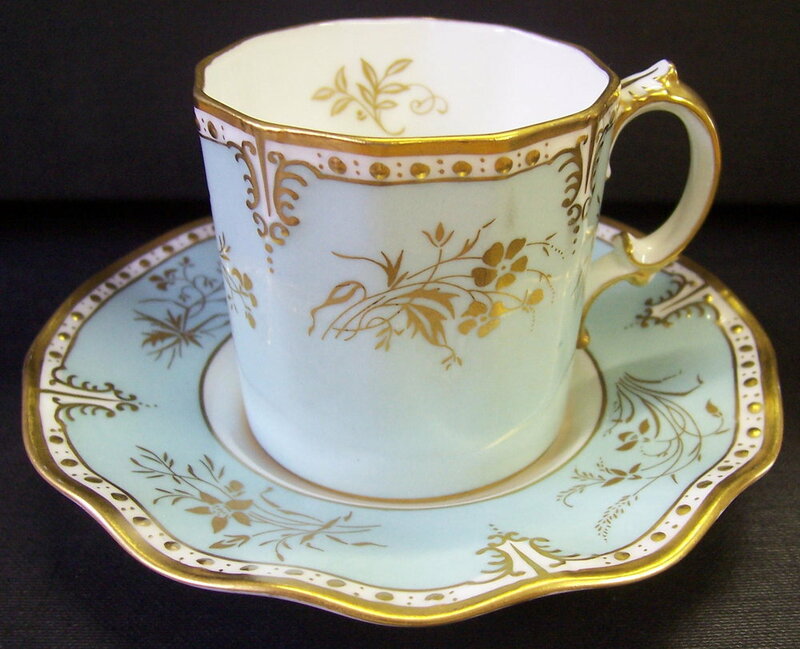 A1297 – “Fleur de Lys” Dublin shape teacup and saucer (The “low” version). Litho pattern. Hand gilt gold edge, line at shoulder, foot line and traced handle. A1298 – “Indian Tree” Another litho pattern with gilding similar to A1297. A1299 “French Orchard” – Elizabeth shape teacup and saucer. Gilt edge, thick gold foot line and solid gold handle. By this time towards the end of the fourth book containing patterns A1 onwards, the practise of entering the patterns into the book had been abandoned, and instead the litho patterns were merely placed between the pages to act as a record. No doubt the cost in terms of time and effort and the apparent ending of the replacement service meant that the maintenance of a full record was no longer justified. Some patterns are now released without a marked pattern number. Below I have included images where I have examples in the collection, and pattern numbers where I have seen marked pieces. A1300 “Carlton Blue”. A1301 “Carlton Red”. A1302 “Carlton Green". A1303 “Grenville”. All are in the surrey shape. Grenville was introduced in 1986 (John Twitchett and Betty Bailey). A1304 “Savoy” (Not shown). A1305 “Ambassador” Duesbury Shape. A1306 “Chatsworth”. (Not shown) A1307 “Floral Dance” (Not shown). A1308 “Derby Days” Surrey shape. A1309 “Blue Aves” Ely/Chelsea shape. Revival of pattern A72. A1310 “Black Aves” Ely/Chelsea shape with gold trim. A1311 “Cobalt Band Gold”. A1312 "Terracotta Band” . A1313 “Green Band”. Factory Mark for 1985. A1314 “Border 1128” Duesbury Shape. A1315 “Kedleston” Duesbury Shape. Kedleston was introduced in 1987 (John Twitchett and Betty Bailey). A1316 “Quail” Dublin shape. This pattern appears more often in quail shaped tea sets. A1317 “Cloisonne”. Apparently the pattern was originally named “Sunrise”. Duesbury Shape. A1318 “Wilmot” (Not shown). A1319 “Asian Rose” (Not shown). A1320 “Carlton Gold” Surrey shape. Ignore the crest which was no doubt a special order in this example. “Carlton Gold” is the last entry in Book 4, the final pattern book. A1321. “Honeysuckle” Ely/Chelsea shape. 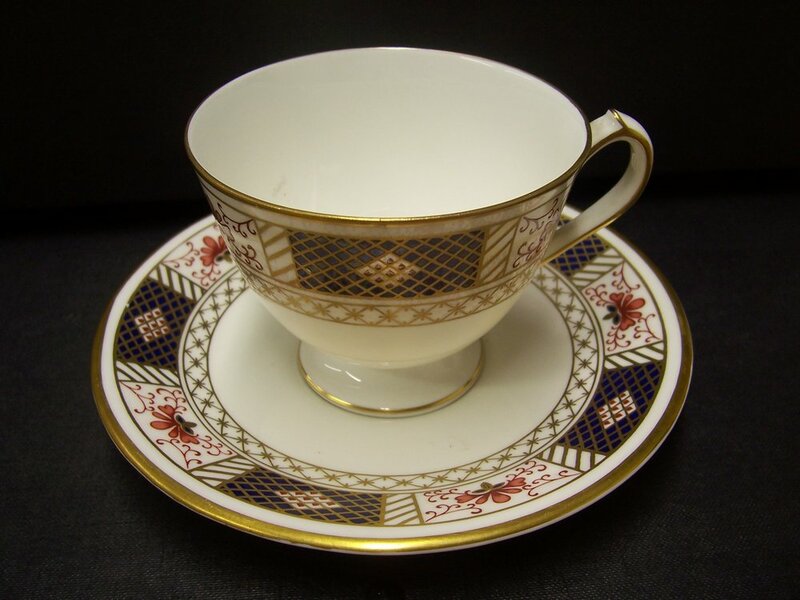 A1322 “Dauphin” Duesbury shape I believe but here as an Edinburgh shape coffee cup and saucer. A1323 “Chardonnay” As A1322. A1324 “Imperial Palace”. Duesbury shape. I have found no patterns numbered A1325 or A1327 so far. A1326 “Milldale Gold” – Surrey shape. 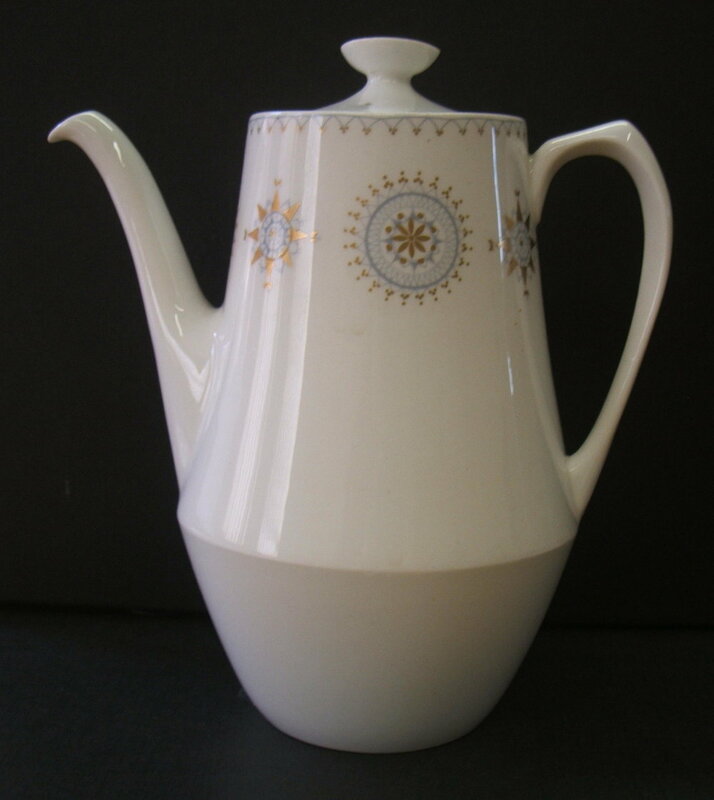 A1328 “Rutland” – Duesbury shape, here as a coffee pot. A1329 “Chatsworth”. Surrey Shape. A1330 “Elizabeth Gold” Royal shape with millennium date cipher. I have an identical plate with date cipher for 1957, so A1330 would appear to be a re-issue/revival. Also seen with green enamel dots instead of gold but marked with the same pattern number. I have found no pattern A1331 to date. A1332 – I have found no pattern details to date. A1333 “Chelsea Garden” Ely/Chelsea shape. A1334 “Kensington”. Ely/Chelsea shape. A1335 “Red Derby Panel”. Ely/Chelsea shape. This example is a breakfast cup and saucer. A revival of A1236. A1336 “Derby Japan” Ely/Chelsea shape. Apparent revival of the “Kings” pattern 383. A1337 “Billingsley Rose”. A1338 “Veronese” Duesbury shape. A1339 “Elizabeth” (Not shown). Platinum version of A1330 also in the royal shape. A1340 “Black Aves”. Platinum version of A1310. A1341 “Milldale Platinum”. Surrey shape. Platinum version of A1326. A1342 – "Treasures of Childhood". A1343 “Tiepolo”. Duesbury shape. A1347 "Cobalt Band Platinum" A1347 also used for "Mustard Service" and "Chocolate Service"
A1359 “Heritage” (Cobalt and Dark Blue, Forest Green and Turquoise, Heritage Red and Cream) Ely/Chelsea. A1370 “Princess” (Green Version) Ely/Chelsea. In 1988 a series of six old patterns were re-introduced under the title "The Curator's Collection" and were unnumbered. By 2012 the long established practice of numbering new patterns seems to have been abandoned. The dates given below are the copyright years shown on the factory marks or are the launch dates taken from Tableware Magazine. The following date from 1996-2014 but so far I have not had sight of a factory mark to be more specific.